Johannah’s latest mosaic series features endangered flowering plants native to our home state of Virginia as well as other parts of the eastern United States. Like the Nature series from last year, the Endangered Flowers series was inspired by the beauty of the natural world around us. This time, I wanted to speak more openly to the destruction and chaos we humans have inflicted on the world. And I wanted to stick close to home, explore my own backyard so to speak. 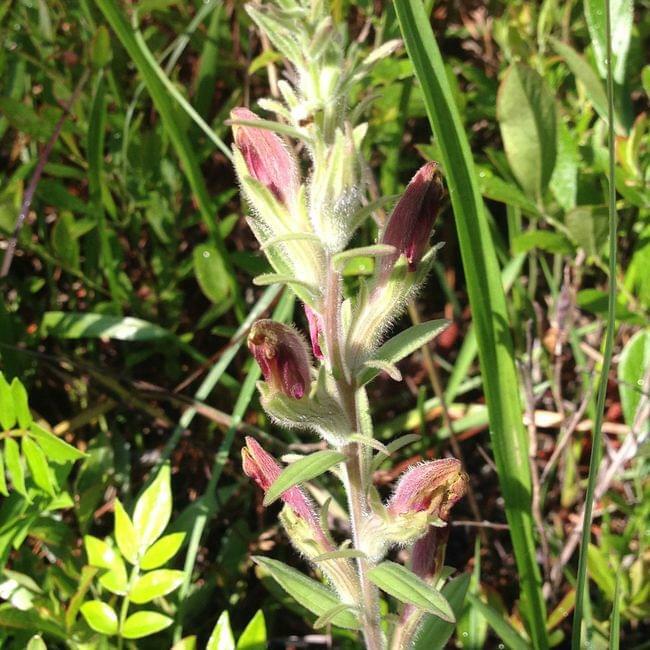 As I researched native Virginia flowers, the same primary environmental threat kept popping up: wetlands habitat loss. The four flowers I chose to represent are (L to R in photo) swamp pink, pitcher plant, American chaffseed, and Virginia sneezeweed. Each of these plants lives and grows in wetlands such as sandy coastal or boggy areas. There were many other plants to chose from, and most of them thrive in similar ecosystems. As our built environment spreads ever outward and we continue to pave more of the earth’s surface, we both destroy natural wetlands and create ever-worsening flooding issues. Further, the retention ponds we create to replace wetlands are no true substitute for the plants and animals that live in those wetlands. We may have built ourselves a place to store the water we’ve displaced, but in the process we’ve destroyed an important part of the ecosystem. Even the current Environmental Protection Agency agrees that wetlands, like those other crucial but fragile systems, rainforests and coral reefs, are vital to life on earth due in great part to their tremendous biodiversity. Like all our mosaics, the Endangered Flowers series is created with 100% reclaimed or environmentally sustainable and stable materials. A portion of the proceeds of the sale of this series will be donated to the Flora of Virginia Project. Take a look below at a few work in progress shots as well as photos of the flowers themselves that inspired this series! You can find the Endangered Flowers mosaic series as well as some of our other work in metal and mosaic in our shop. We hope you were inspired by the summer environmental tips we shared a few months ago for the beach, camping, and more. A recent piece from Slate reminded us that even late in the fight for environmental sustainability, personal choices still matter. By making changes in our own lives, we help create a culture of personal investment and systemic change. With that in mind, for those who celebrate Christmas, here are a few of the ways our family tries to reduce our environmental impact at this time of year. If you've got others, we'd love to hear them! Shop locally for your gifts. This helps reduce the carbon load created by shipping, and supports your local economy, including small businesses like us! Paper gift bags can be reused several times, and cloth bags have an even longer life. Make your own gift wrap! We like to to use old maps, magazines, or book dust covers. Craft paper or paper shopping bags work great too. You can decorate them with stamps or drawings, or use them just as they are. If you buy commercial gift wrap, look for one made from recycled materials. Avoid metallic papers as they can't be recycled. If you put up a live tree, purchase one that is locally grown. We visit the Francisco Farms out of Staunton, VA at their Midlothian tree stand every year. Or look for a farm where you can cut your own! Choose lighting for your home and tree with LED lightbulbs. They use less energy and have reduced fire risk over old-fashioned incandescent bulbs. Once you're ready to take the tree down, have it recycled into mulch. Many municipalities offer this service. Keep an eye out for information starting in late November. When running those endless errands, plan your trip from your farthest stop on your list to the closest. This makes your drive more efficient and reduces your carbon load. At parties or shared meals, use reusable dishes if possible. Replace single use plastic with biodegradable paper plates and napkins. Wash plastic cutlery so it can be used again. Now that all the leaves are coming down, don’t bag them! Shred them with the lawnmower or rake them up and use them as mulch to help winterize your flower and garden beds and provide habitats for beneficial insects and other animals. Add some to your compost too! Keep your thermostat turned down as low as you find comfortable to reduce the heavy load heating puts on our energy grid. Much of our energy is still coal-based, so this also helps reduce fossil fuel pollution. And of course, whatever holiday you celebrate, we wish you the very best, loveliest celebration as we close out the darkest part of the year and welcome the light of the new year. At Phoenix Handcraft, the end of the summer is a time for us to step back to get a broader view of our business, to plan out the next few months, and to check in with our longer-term goals. This summer we're reviewing our company values, with environmental sustainability at the top of the list. We're always trying to do better in this area, as a business and as a family. We love getting tips from others to help keep us inspired, so we thought we'd share a few tips here as well! We hope to make this a regular series, both here and in our newsletter. So without further ado, here are just a few ways we can all do better in the summer months in treating our beautiful Earth right. Use mineral-based sunscreens and treated clothing to avoid coral damaging chemicals found in "standard" sunscreens. Pack out everything you bring, and bring an extra bag to collect trash and litter you find on the beach. Use reusable dishes if possible. Replace single use plastic with biodegradable paper plates and napkins. Wash plastic cutlery so it can be used again. Bring along large containers of water and reusable bottles or cups to avoid single use water bottles. Set up your tent on the designated tent pad, and keep foot traffic to the campsite as much as possible. This helps contain the area of compacted soil, allowing trees and plants to flourish around the campsite. It also helps prevent additional soil erosion. Water early in the morning or later in the evening to prevent water evaporating in the heat of the day. Plants can also be burned by water on the leaves in the bright sunlight. Use cut grass, raked leaves, or mulch between plants to keep weeds down, decrease water evaporation, and add nutrients to the soil. Line dry clothes and linens. With all the rain this summer, it's been hard to find sunny days, but even partially line drying helps save on energy! Keep your thermostat turned up as high as you find comfortable to reduce the heavy load air conditioning puts on our energy grid. Much of our energy is still coal-based, so this also helps reduce fossil fuel pollution. If you have any great tips you'd like to share, please feel free to send them along! We always love to learn new ways to do better. And if you'd like to get these tips straight to your inbox every quarter or so as we send our newsletter out, we'd love to have you!